The Other Half of the Fun : The Travel of Getting There » UrbisMedia Ltd. I think my first associations with travel were gastrointestinal. My parents and my aunt and uncle used to take my brother and me on a long drive up to the lake in the Adirondacks for two weeks each summer. I love those two weeks in Summer, they seem to last forever, swimming, fishing, skipping rocks on the placid lakes surface with my brother. But I hated getting there; several hours of queasiness and the heaves. I had such a case of motion sickness as a kid I could get “mal de trottoir” just walking down the street and turning my head too fast to one side. My buddies took to walking a few steps behind for fear I would puke on them. My mother, who was explained this predicament by saying “he was a colicky baby,” would make it comfy little space for me in the car on the drive up, with pillows in the back seat for me to rest my pukey little head. She would keep crackers handy, being bland and the least offensive in regurgitated form. There was always a bucket with in reach. So I had to wonder the first time I heard the phrase that “getting there is half the fun.” Nevertheless, my motion sickness appears not to have diminished my love for travel on whatever mode of stomach–churning conveyance I have taken. And, amazingly, though I have nearly reached for a “little white bag” a time or two, I’ve not displayed my undigested lunch to anyone since those childhood summer sojourns to the lake. Most of us think of the fun part of travel as the destinations, the fascinating cities, the monuments, museums, mountains, beaches, and such. The connective part between our homes and among various destinations, is generally regarded as a necessary part of travel but, particularly in present day of TSA, “getting there” is likely to be considered far less a portion than half the fun of travel. We have long forgotten that the word, travel, is derived from travail, from a time when travel away from one’s home was arduous and perilous. It still can be uncomfortable and dangerous, but there are also those times, settling into a train compartment with a good book and a bottle of wine, with quaint villages and countryside a constantly changing tableau, of lazy days on a ship’s deck chair on gentle seas, of new arrivals in grand terminals, filled with anticipation, when getting there can at least seem like half the fun. 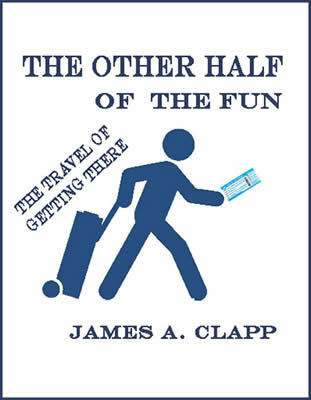 This book is to compliment my previous travel book, The Stranger is Me: Travels and Self-Discoveries (2007) with stories of the half of the travel experience that is The Other Half of the Fun.